Is That a Hernia in Your Abdomen, or Are You Just Happy to See Me? If you’re like me, you get rattled when latex gloves are pulled out of the examination room drawer. It’s when… and I apologize for this… the rubber meets the road during a doctor’s office exam. That’s the point at which the appointment figuratively speaking goes from getting to know one another over lattes at Peet’s, to warily searching for the exit doors in the lobby bar at a Marriott. One minute you’re answering questions and having a completely calm conversation, and the very next you’re trembling at the sight of those gloves slowly being fitted around a physician’s hands and fingers. Groping of your most private of areas is about to commence. While I am thankful for his office’s acceptance of my modest insurance co-pay, I’m also thinking that this guy could splash on some aftershave and perhaps pipe in a little Bill Evans or Sade for a more soothing atmosphere. You know, give me something other than the inability to sit comfortably for the next hour. But no, the experience is really nothing more than a temporary and acknowledged invasion of my privacy and pride. The only saving grace is the knowledge that it’s probably the last thing the good doctor also wants to be doing at that moment. All those sailing magazines in the waiting area and examining rooms are proof of that. Which brings me finally to the point of this post. I recently endured such violations to my body not once but twice in the last couple of weeks. 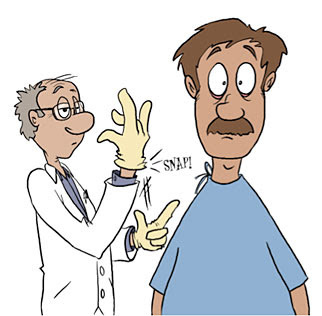 A simple follow-up visit to my general practitioner for a discussion of lab results inspired him to somehow to initiate one of those “turn your head and cough” exams. One minute we’re discussing a slight increase in my cholesterol count and in the next I’m suddenly dropping drawers. Usually these are quick, how-do-you-do incidents which transpire as we discuss the high cost of docking his schooner at a local marina. This time, however, our conversation is cut short by a sudden kick-back from my abdominal area. This is not the normal drill. Usually after one pass with the crown jewels, I’m zipping up and we’re jointly complaining about the 12b-1 fees of our actively managed funds. This time, though, he’s annoyingly more interested in my jewels instead of Wall Street equities. He asks me to put my hand where his just was, and again repeat my turning and coughing. This is quickly turning into a re-creation of some of my earliest dating experiences. The memories aren’t cozy. Great. Nothing like a medical annoyance to start out the new year. I’m immediately set up for a consultation with a nearby surgeon. An appointment is scheduled for the following Monday. Except for some painful kidney stone calamities, I’ve been very fortunate in my adult life to have avoided serious visits with surgeons and hospitals. You wanted retirement and all that goes with it, huh? Okay, but it ain’t all just part-time jobs and thrice-weekly visits to the beach, boychik. Welcome to age-based medical issues. The visit with the surgeon turned out to be uneventful and unremarkable. With more turning and coughing on my part, he quickly determined that I indeed have a hernia that needs to be repaired. It was fortunately caught early, and because I am experiencing no pain, he said it’s completely up to me if I want to repair it now or wait till I begin experiencing discomfort later. It’s not exactly Sophie’s Choice, but I was conscious of both Gorgeous and the surgeon staring at me to make the decision right then and there. Neither were giving me any hints as to which way to go, but I decided to be proactive and have it taken care of now rather than later. Time is money; just get on with it. It should also be noted that the surgeon’s primary magazine of choice is Popular Mechanics. I suppose in some measure that’s reassuring, but I have also decided that his waiting room is not one in which I wish to revisit to read it either. I have my limits. Tomorrow I have to call his office to schedule my surgery. To be continued. For some related comic relief, check out the always wonderful blogger Trefology, and his take on Superman being under the weather. As Dave Matthews sings, I ain’t no Superman, and heavy lifting is probably out of the question for the next few months. Darn it all. My husband just needed a re-fill. He waited 2.5 hours and was in the doctors office for 2 minutes. He was reading his book on his i-phone, but before that, looked at the very old magazines in the waiting room. They were all about food and inundated with advertisement about stuff we do not need: vitamins and supplements. The good “old doctor” is no longer….first of all, even in Canada we cannot get a family physician as there is a shortage. The walk-in doctors are new immigrants from developing countries and although I am pleased there are doctors, I wonder what happened with the locals trained at at our expensive universities. I also wonder why the newcomers all come to Canada, aren’t they needed in their own countries? Do we not train enough doctors?I thoughts that we trained heaps and the majority these days are female! I heard that the newly trained doctors (in Canada) are also screened for “bedside manners” and that rather than just academics, empathy and good care is seen as equally important. I have not had the opportunity to experience this. At the doctors’ I am treated like everyone else (at least there is equality) as a number and as a nuisance. No female doctor in sight: All immigrant doctors from India, Pakistan and Africa are male. 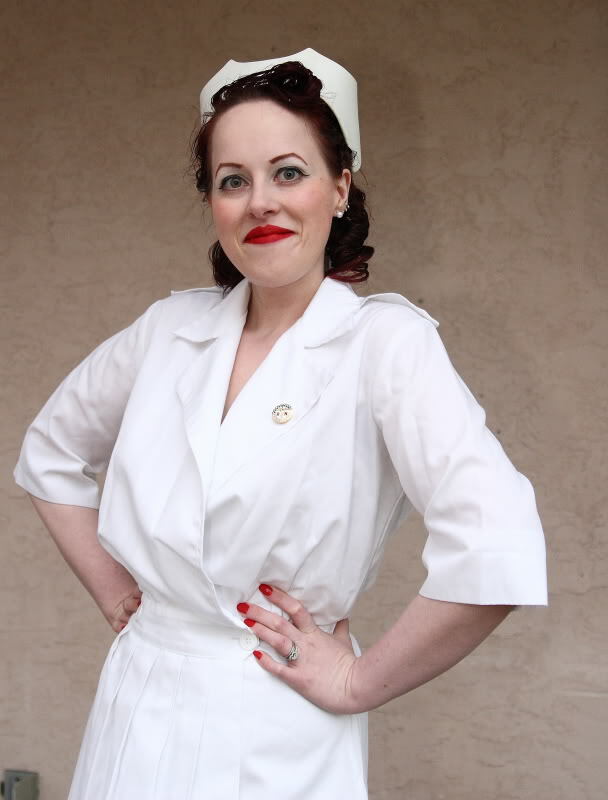 I am NOT having the “treatment” done similar to you: An invasive one by a male who is brand new in this country and who expresses a reluctance to even ask when my last pap-smear was….It stinks! Where is Michael Moore when you need him? In the mean time, Marty, take it step by step. It will be fixed….after all, you are in a highly technological developed country. What could go wrong? What could go wrong indeed, Elisabeth! Well said. I read recently about how the Indian government and medical societies are managing a crisis of “doctors” who have somehow coasted through medical school + some kind of residency, but sadly are not in any way able to function as medically-trained doctors. If this is true, I hope for all our sakes that a percentage of them aren’t coming abroad to find work in medicine. That would be a scary development. Your report here is not a good omen for those of us who support a nationalized medical system. I had always hoped that Canada’s system could be a proper template for ours here in the U.S. I hope things improve up there for you! Michael Moore was a bit too optimistic about Canada. We have no family doctor, and we have no neurologist for my son (he is on the waitlinglist). We looked for doctors who were taking new patients and the reviews were poor. We picked one, and although I did want to like him, the first appointment with him was as we were in a bizarro world. Too strange to describe. He was also very nervous around me. Yes, do not immigrate to Canada yet…too soon. Will let you know when things approve. My husband had one of those about 20 years ago. He was still working and took the time to catch up on movies and books. Of course he milked the “no lifting” for as long as he could! Somehow, enjoy the time. You will have a free “do nothing” card where you get no guilt from anyone. You can get more than 2 weeks out of this for sure! I’m sorry but I was laughing before I even started reading. I knew where this was going. Loser had a hernia. Of course, I knew nothing about it until he asked for a ride home from the hospital. The doctor released him to me, since I was a medic…and what a wuss! Take advantage of the “no lifting” and unless you’re a wiener, don’t rely too heavily on pain drugs. You could move the wrong way and injure yourself or the site without knowing….if you’re hopped up on drugs. Ha! I’ll call it the mysterious disappearance of a mans’ hooter. Absolutely! I think it was Emily Sailers who said that at the end of a song on one of the Indigo Girls albums. I say it a lot myself. And, yes, if I can’t bear the pain I will at least try to enjoy the groping. Thanks for reading! I had a hernia repair in the 80s and of the many surgeries I’ve had, it was the least problematic. Does that help? The worst part of surgery is always waiting for it to happen. Always. That is now the purpose of your life. Mine is to write about poop. I think you are smart to get it taken care of now. If you waited, you’d go through the same surgery, with the added fun of being in pain first. Good luck, my friend, and milk the “do not lift” rule. I think there are also “lots of TLC,” “eat all your favorite foods,” and “binge-watch TV” rules to be followed too. No one was saying anything in that room when the options were presented, so I had to go on non-verbal cues that I felt were leading me to have it done now. Once I said I would, I seemed to have gotten the same kind of reinforcement you just gave. Good to know I made the right decision. And, yes, I am going to milk this for all it’s worth! Good luck with the surgery and congratulations on having someone to help with the heavy lifting (some of those cocktail glasses are actually made from lead crystal)! Well, pooh, but I’m glad they found your hernia before they became a big deal. Heh. I had a visit with a urolI gist today and had the whole rubber glove treatment, as well. I so did not expect that. Damn. Yes, all done in the name of preventive medicine! It’s better to fix it now and not wait til later. Good luck with it Marty. It’s only a standard procedure so not to worry . I’ve got my referral for the vein guy. Going to get those varicose fixed when it’s closer to Winter. Not looking forward to wearing support stocking whilst they heal but well got to be done . Anything that is invasive is not high on our list of “just can’t wait to do this” list, but I’m in agreement with the “better to do it now, than to wait until the pain becomes unbearable” plan. Having had three hernias repaired at different times in my life, I can say that you should take the NO LIFTING suggestion seriously, as tearing a recently repaired hernia can cause an even more invasive surgery, complete with the possibility of losing part of your inner plumbing. Ah, those are indeed important lessons and words of advice. And, yes, let’s let that party be nameless! Take care…and thoroughly enjoy your “do nothing card”. I agree with Kate….you should be able to get more than two weeks out of that card! Please keep us all posted. Obviously I have different parts to you, but as someone who has had rather more investigations than I’d have liked recently, I feel your pain!